There is much to envy about the life of writers. On the other hand, it is a life of long periods of working alone, and while being alone and being lonely are not exactly the same, they can overlap. It is a life of much labor and frustration. The love that the writer pours out onto the page goes for a long time–and maybe forever–without being requited. For most who write, the trips to the bank are not frequent or overly exciting. All this is assuming that the writer or would-be writer actually gets a manuscript completed, manages to get it revised, finds some way of getting it published, and then actually sees it get into the hands of willing readers. Lots of people would like, so they say, to write a book. Lots of people think they could write a book. Most don’t get books written. How many of those completed manuscripts should not have been written and should not be published is a different story. Overall, the “successful” writers’ life is a hard life. 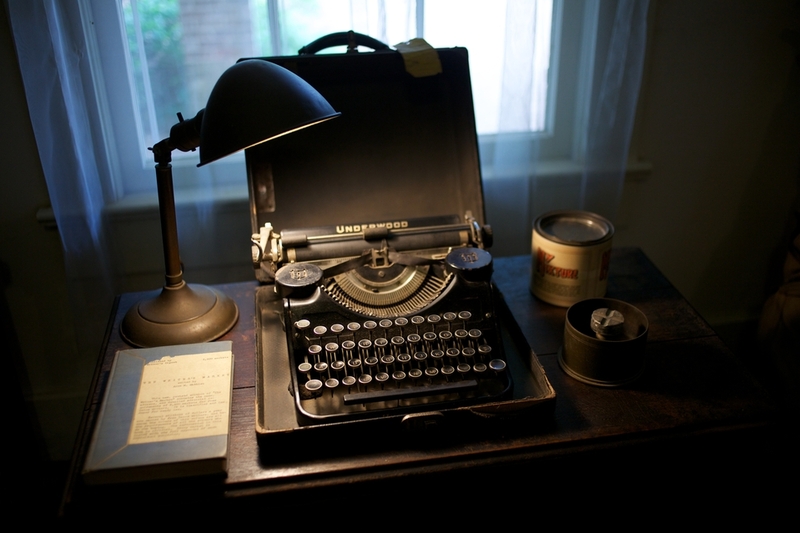 Only a very few writers in any field make enough money to live off of writing. Often even the more successful writers find it necessary to devote lots of time to publicity and book signings and speaking in order to draw attention to their books. That is the writer’s life. I know a bit about it, having written a book or two and having written lots of articles and book reviews. I also know something of how difficult it is to get the word out that a book has been written and is in desperate need for buyers and readers. So, I am highlighting some books by Christian authors I know. In most of these cases, I these are men that I only know through correspondence and social media. However, I have discovered so many common bonds that I feel like we could have been life-long personal friends. The first of the books is War in the Wasteland by Douglas Bond. Set in World War I, this novel includes some actual people, such as C. S. Lewis. There are also fictional characters. I found myself drawn to this book for two reasons. First, I used Bond’s book Hostage Lands in my junior high class. Set in the days when Romans and Celts were battling over lands north and south of Hadrian’s Wall, this book is rich in history with a compelling story of faith built in. It passed the most difficult test: The judgment of junior high students. After we read the book, one of them asked if we could read more books. Already being pleased with this Bond book, I wanted to read his book on World War I in conjunction with my teaching on the Great War and my readings of some six or more other books on that war. Bond’s books are perfect for introducing young people to history and reinforcing faith issues. I confess to being some 20 plus books behind in covering all of Douglas Bond’s many works, but this journey to completion is now underway. George Grant is no novice when it comes to writing books. I have a whole shelf full of books he has written or compiled, and my collection is incomplete. But he is so busy with pastoral duties and teaching that he doesn’t whip out books as frequently these days. But it was exciting to see this book arrive in the mail. An Experiment in Liberty: America’s Path to Independence is a great reading resource for studying American history. I feel myself wanting to use this book next year with my junior high history class. I have not known Paul Rydecki for long. I learned about him through a mutual friend, Ryan Brown. Ryan teaches Latin at Veritas Academy, and he crossed paths with Paul on a trip to Italy. (There is a Biblical precedent for meeting someone named Paul in route to Rome.) A month or so ago, Ryan mentioned that his friend from the Italy trip had just published a new edition of one of Luther’s works. Titled Luther’s Small Catechism: An Introduction to the Catholic Faith, this beautifully done hardback volume is a great edition to any library. Granted, I am a Westminster Shorter Catechism man, but I love the Heidelberg Catechism, the New City Catechism, and Luther’s Small Catechism. This is a handy, compact of Christian truths. Besides the catechism, the book has a really useful list of Bible memory passages. And for those of us still getting our minds wrapped around the best of Christian traditions, it has a lectionary for Bible readings throughout the year. Along with Christian education, a good church, and a solid family, getting grounded in the historic, Biblical, and Reformation-based creeds, confessions, and catechisms are the most important components for Christian living and discipleship. So, I urge everyone at whatever age or stage of life to begin reading and learning creeds, confessions, and catechisms. Go to the historic documents of your own church tradition, but then branch out and little and glean from the breadth of God’s field. Luther’s Small Catechism is a fine source for those of us who need to do more than just admiring Luther. 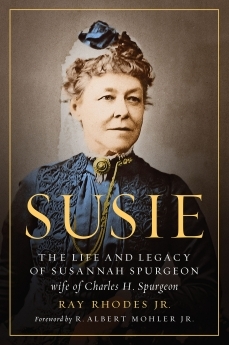 A book on that is on my “Read Next” stack is Susie: The Life and Legacy of Susannah Spurgeon–Wife of Charles H. Spurgeon by Ray Rhodes, Jr. There are quite a few things that commend this book. First of all, it is related to the life of Charles H. Spurgeon. If I had my life to live over, I would have invested time and money in obtaining the sermons and writings of Spurgeon much earlier and with much more diligence. I am where a person ought to be at age 20 in terms of reading and cherishing Spurgeon. I will not refrain from encouraging others to read the man himself. Read Lectures to My Students, An All Round Ministry, John Ploughman’s Talks (now reprinted as Spurgeon’s Practical Wisdom), Treasury of David, and the many, many collections of his sermons, but especially the series published by Pilgrim Publications. And read biographies of the man. That being said, if this woman merely knew Spurgeon, her story would be of interest. But she was the woman behind the great, but often suffering pastor, preacher, writer, and organizer of many ministries. Add to that, I have heard so many recommendations of this book. I will be writing a review just as soon as I finish reading this work. But don’t wait for me! Get the book. I reviewed Shortgrass by John J. Dwyer just a few weeks ago. I am still reeling and swooning over that book. I can hardly wait until the sequel comes out in May. This novel is set in Oklahoma in the years of the Great Depression and the Dust Bowl. War is looming in the near future, in spite of promises to the contrary by President Roosevelt and actions to keep us out of it by Charles Lindberg (both of whom appear in the story). It was an age where flying was still coming into its own and was filled with thrilling adventure to those willing to learn the skill. Lance Roark, the hero of the story, is the guy I would want to be. Don’t parade any super-heroes before me, for they fall short of Lance. The Resistance by Douglas Bond is his newest work, and my copy just arrived this week. This is a companion volume to War in the Wasteland, and it promises to be another great story set within a historical context. In this book, the setting is World War II. Expect more later. But note this: Both The Resistance and War in the Wasteland can be purchased together for a mere $25. If you are homeschooling, use education as the excuse for buying these books. If you are a Christian, use that as an excuse. Find some reason and buy these books. Coming soon: New books by P. Andrew Sandlin, a reprinted book by David Chilton, more on Dostoevsky and Flannery O’Connor, new and older works on philosophy from a Christian perspective, more books on World War II, and books by historians that I have become acquaintances/friends with. I have a confession to make, and it will be of no great surprise to those who know me well. I don’t prefer fantasy, science fiction, or what I might call Christian fantasy. I have read and felt the power of The Chronicles of Narnia (although my reading was late in life) and I read and enjoyed The Lord of the Rings (and The Hobbit, but not The Silmarillion yet). Does Fahrenheit 451 count as science fiction? I love that book, of course. But as a whole, in general, and overall, give me a novel with a realistic twist and a setting in the south or the west, preferably in an earlier era. For that reason, I love Wendell Berry’s books. And although William Faulkner’s southerners are often (nearly always) a bit on the eccentric, weird, and warped side, I love Yoknapatawpha County. The books of Jesse Stuart are among my favorites, and Hie to the Hunters is the most popular book I teach. The books of Ron Rash, some of Bret Lott’s novels, the Joe Pickett novels of C. J. Box, and the non-fiction, but deeply southern books of Rick Bragg are among my favorites. So, it should be no surprise that I read and liked Shortgrass by John J. Dwyer. But I was surprised. You see, it is a bit awkward when one reads a novel by someone you know. John Dwyer is in the category of a good friend I have never met. We live in neighboring states: He is in Oklahoma and I am in Arkansas. I have personally inscribed and autographed copies of his biographical novels about Robert E. Lee and “Stonewall” Jackson. I have his study of America history, titled The War Between the States: America’s Uncivil Civil War. I read his posts on Facebook with joy and laugh at his grandson’s cute antics. But his and my paths have not crossed. We would be instant friends because of so many shared interests, although I would be a bit daunted by all he has done and is doing. Here is the difficulty: What do you do when a friend or acquaintance writes a book and it is only “so so” or even worse, what if it is awful? Usually, I can find some good points in most books. I have read a few where I found myself hoping the authors would kill off the main characters and end the book more quickly. The good news is that I not only found this book pleasing to my desire to read about people in a past-tense southern setting and I found it quite enjoyable. In fact, I am now chomping at the bit for the sequel which isn’t due out yet for a few months. So, let me talk about this book a bit without any spoilers. Shortgrass: A Novel of World War II by John J. Dwyer is published by Tiree Oghma Creative Media. You can read and learn about the book from John’s website found HERE. The story is set in Oklahoma (which is no surprise since John has written some histories of that state) during the 1930’s and 40’s. The book is set in a historical context with lots of references to political events of the time, primarily the Great Depression, the New Deal, and the looming prospects of war coming to America. The main character is a young man named Lance Roark. Lance is the All-American boy in many respects. He loves his family, excels at football, loves his horse Jeb deeply, and faces all sorts of challenges and threats to his future. While Lance is a great guy, he is not perfect or flawless. He struggles to know what to do, which direction to turn at times, and how to curb his appetites and desires. And Lance is a Mennonite. He is not nominal believer, but rather is deeply committed to following Christ. On the front line–to use an awkward analogy–the issue of interaction with the world is critical for a Mennonite believer. Going to war is verboten (German for forbidden). But what about other interactions in this world, or in Lance’s world, like football and college and girls of other faith persuasions? I have to admit that the opening chapter created great doubts about the book in my mind. It begins with the story of Lance’s senior year and a football game that turns into a brawl between neighboring towns. If you don’t understand the intensity of small town sports rivalries, you won’t get this chapter. Football has never been my sport. God made me far too small, too slow, too uncoordinated, too unaggressive, too clumsy, and totally unfit for anything resembling sports competition, especially football. But I was enduring the chapter until the end when something happened at the end that hooked me into the book. So much for plot details. Here I shall say a word or two about the importance of the book. First, it accomplishes what a piece of fictional writing is supposed to do. It provides enjoyment. Great stories are enjoyable in many different ways and at different levels, but beyond all great themes, worldviews, philosophical underpinings, and the like, a story is to be enjoyed. Mark Shortgrass a success here. Second, this book deals with the struggles of a believer who is facing challenges to what he believes. Lance has two loves pulling for his attention: He wants to work at a mission among the Comanche people and he wants to fly airplanes. Add to this all of the other things tugging at his heart and life: Family, friends, football, girls, college, career, and the war. Lance’s people had known religious persecution. During World War I, the Mennonites in his community and background had been harassed and persecuted for their pacifism. Their Germanic heritage caused people to accuse them of being in sympathy to Germany in World War I and their refusal to fight resulted in their being called cowards, traitors, and worse. This is no book about shallow faith or easy believe-ism. And it is not a sappy religious story of a good boy who finds the doors open to him as he obeys God all along the way. An curmudgeonly Presbyterian Calvinist like myself found much in this book that resonated with my own life. Third, this novel is set in the midst of a historical time-period with interactions and appearances of actual historical figures. This gives the book a real feel. If it did not actually happen, we know it could have. Don’t want to overkill the book with praise here, so let’s give this review a rest. Unfortunately, it will have to be a long rest since Mustang, the sequel, will not be out for a few more months. John J. Dwyer, novelist, historian, Christian, and real Oklahoma cowboy. Alfalfa Bill: A Life of Politics and What is History Anyway? Alfalfa Bill: A Life in Politics by Robert L. Dorman is published by the University of Oklahoma Press. Twentieth century, political biography, southern history, and interesting, but often forgotten characters in history: All these were draws for me wanting to read Alfalfa Bill. The biography is about William H. “Alfalfa Bill” Murray who was a key political figure in the early days of Oklahoma statehood. It is often not thought about, but Oklahoma became a state very late in the process. In 1907, it became the 46th state in the Union. Of course, it was in the thick of events in American history long before statehood. There is no understanding of Oklahoma history without recognition of its previous existence as a land set apart for Native Americans. That would have created enough adventure, but white Americans (Surprise! Surprise!) realized they wanted part of the Indian Territory. Bill Murray was Texas-born. 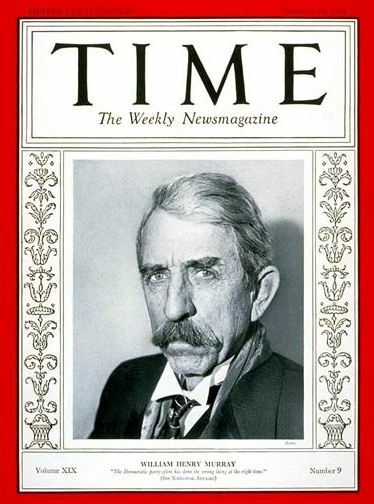 After the kind of tough upbringing so characteristic of his times (1869-1956), he found his political and personal options in Texas diminished, so he lit out for Oklahoma Territory. He is one of Oklahoma’s great success stories. Only, he often suffered quite the opposite of success. His political career was a series of disastrous defeats and surprising victories. It was hardscrabble politics and brawling every step of the way. On several occasions, Murray would reach a pinnacle of success only to see that turned into a bitter setback. A big part of the Murray story is longevity in politics. He served in a number of political roles. He balanced the weight of varying political forces that contributed to the Oklahoma firestorms. In his favor, he married a woman who was of Choctaw-Chickasaw heritage. He was well schooled in politics due to a smattering of formal education and personal readings. He was a man who understood–like all successful politicians–how image is so vital to political credibility. Forever, he was touting himself as a farmer, and Murray did have a farm or two along the way; however, he was not really a farmer and was certainly not a success at it. The high points of his career were the prominent positions he held in his long tenure as a political figure. He was president of the Constitutional Convention in Oklahoma. Unlike the legendary quiet, but powerful persona of George Washington at the 1789 convention, Murray was up to his neck in the rough and tumble of the political document-creation. He served several terms in the United States House of Representatives. That may have been his finest hour in terms of his political skills, networking with powerful political figures like President Woodrow Wilson, and showing real non-partisanship. As the 1932 Presidential election neared, one thing was clear: This was going to be the time of a great Democrat Party win against the hapless Herbert Hoover. Among those who toyed and attempted to win the nomination was Oklahoma’s “Alfalfa Bill” Murray. His candidacy was pretty much a flop. (Compare it to Rick Perry, Bobby Jindal, Lindsay Graham, and many others in 2016.) Murray gave some attempts to run a campaign without money, political guidance, and a slim chance while going up against more powerful figures like John Nance Garner from neighboring Texas and Gov. Franklin D. Roosevelt from New York. In one sense, it was the 1932 Presidential election that began drawing the closing curtain on Murray’s career. Rather than flocking to Candidate Roosevelt, Murray had said some rather cruel and over-the-top things about the man who was to become the face of the Democrat Party. By 1936, Murray was supporting Alf Landon in his hapless race. In all following years, Murray’s ventures into political events seemed more and more Quixotic and hopeless. All in all, a colorful career politician, Bill Murray was. Legendary in Oklahoma simply due to the fact that he accomplished a lot even though he was as self-serving as so many are. He was lovable and deplorable at times. On some issues, he was far-sighted; on others, he was blind. He was a product of the prejudices of his time, and that was a day where there were real racists. Politicians would often either echo racist sentiments or truly believe them in order to win. He was a faithful husband, unless one considers politics his mistress. And, sad to say, in his latter years, he was a cranky and often ugly commentator on people and events. I really enjoyed parts of this book, but must confess a few of my shortcomings. Somehow, the details of Oklahoma state legislative battles eludes my interest. (And I am a rather dull person.) The great German statesman Bismarck once said that it is better not to watch sausages or laws being made. Even reading about the processes after the fact–long after–is not recommended either. This question I kept asking myself was this: Who will read my review and rush out and buy this book? Maybe only the first part of that question is relevant. But even people I know who share interests in politics, history, and biographies will not likely rush to order this work. As a book reviewer, I read quite a few books–usually by university presses–that I know want get much notice even as non-fiction. This led to this question: What is history about anyway? I am glad that Robert Dorman at Oklahoma City University devoted countless hours to research and writing this book. No doubt, it was gratifying to him. He is probably giving a few talks on Murray and is being consulted in person or in his printed works for his take on related events. But who reads about the long forgotten political figures of other states? Here is the pertinent problem: How do people, particularly students in my classroom see or understand history? After reading 339 pages of Oklahoma political history, much of it is a total muddle in my mind. The details of the Oklahoma State Constitutional Convention slid right over my thinking even as I was going through those pages (painfully at times). Okay, it’s trivia from early 20th century Oklahoma. What difference does it make? But I am teaching the Russian Revolution right now to my students. What difference does Alexis Romanov’s hemophilia make to them? What difference does the quarrels between Bolsheviks and Mensheviks make? Then when we get to World War II, what difference does it make? Obviously, some people take a shine to history. The Ardennes Offensive is as fascinating as last night’s football game leading up to Superbowl 2019. But we don’t teach courses on everything that happens to be a personal interest of someone out there. Let’s don’t even consider some of the college courses and majors now offered. I am talking about education. A history teacher needs to read books like Alfalfa Bill sometimes just to see how their students view history class. “What is going on? Who cares? and Why do we have to study this?” This is not all just student rebelliousness, but is sometimes rooted in the way different folks process time and events from the past. Was I helped personally by reading this book? Yes. How? I was made better aware of the impact of Socialists in early 20th Century America and even in places like Oklahoma. I was sadly made aware (again) of some extremes of racial prejudice that were then prevalent. I saw the futility of a life devoted to politics with political success seen as an idol. Nothing is new under the sun. Ugly has always existed. “Dear children, keep yourself from idols” (I John 5:21). For those who like political biographies of past governors, I would recommend T. Harry Williams’ great book Huey Long or any books on a former California governor named Ronald Reagan. For those interested in Oklahoma history, read the books by John Dwyer, such as The Oklahomans (volume one is out and volume two will be in time). For a fun and uplifting account of Oklahoma life, read Dwyer’s book Shortgrass. Maybe I do believe in what is called “Second Blessing.” And I certainly do believe it is the power of God’s Holy Spirit at work. And it was not something that happened when I was a new Christian. The Second Blessing that I refer to is learning to love mornings. I wish that I could boast of being up by 4 or 5 a. m., but for that to happen, there will have to be a third blessing. 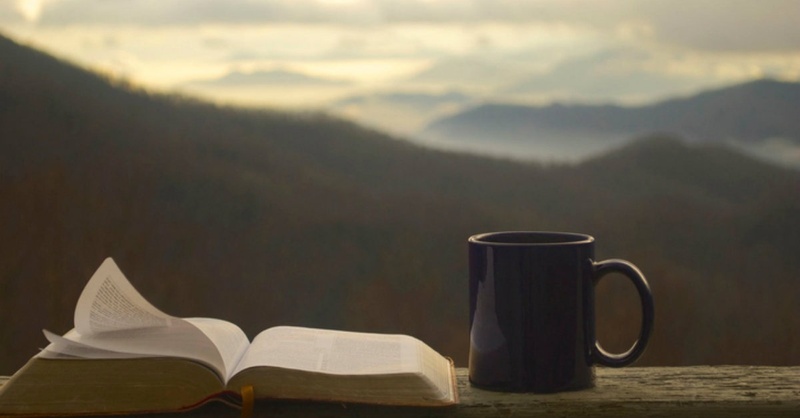 However, I do love mornings, and I love them for the fact that this is the time when I enjoy the BBC, not meaning the British Broadcasting Company, but rather Bible, books, and coffee. Here are some of the recent reads that have been very strongly caffeinated remedies for both the heart and the mind. Mark Jones is a bright, young pastor, theologian, and writer who lives in Canada. His mind, heart, and writing style almost appear to be cloned from the inimitable J. I. Packer. In his book, he does several things. First, he takes the reader through some deep systematic theology. In fact, the central focus of the Christian life is knowing who God is. But this is not the deep end of the Olympic-size theological pool where Jones simply pushes you in and says, “Swim.” He is clear, brief, direct, and very understandable. Second, he has this book divided into 26 chapters with some introductory pages and an epilogue. That makes this book a great resource for reading over the course of a month. Families could read it for the family devotion or Sunday school classes could use it as well. (Preachers: Don’t feel ashamed if you want to use the book for a sermon series.) The chapters are short. In fact, I had planned on finishing the book on January 27, but found myself reading more than one chapter on quite a few mornings. Third, Jones brings you into his circle of mentors, teachers, and guides. Like Packer, Martyn Lloyd-Jones, and Jerry Bridges, Mark Jones is on a first-name friendship basis with many of the Puritans, Reformers, and Church Fathers. One could simply go through this book and read the quotes–all warmly evangelical and nourishing–and delight in it. The notes at the back of the book were announcements to me of books I should be reading and acquiring. Fourth, in each chapter Pastor Jones first discusses and explains the doctrine–God’s Omnipresence, for example. Then he turns the focus to Christ. God’s attributes are found in the Lord Jesus Christ. His Incarnation did not mean that He was not God the Son for a season. But we often don’t realize how Jesus has the same attributes we attribute in a fashion to the Triune God. The final part of each chapter is application. God’s attributes are not speculative, philosophical, or theoretical characteristics of a Supreme Being. Our Covenant God reveals Himself and teaches us through that most vital aspect to all life and learning–Knowing God. Along with this book, Jones’ book Knowing Christ, which I read last summer, is also a fine work. It should be read after reading Packer’s classic work Knowing God. In fact, Dr. Packer wrote the foreword to Knowing Christ. Once again, this book will take the reader deep into the Bible and theology with abundant quotes from the Puritans, their forebears, and heirs. Some may be familiar with Jones from the massive book that he and Joel Beeke compiled titled A Puritan Theology: Doctrine for Life. This is a weighty book in every sense of the word, but one that can be digested in small sections. Maybe this summer, I can return to digging from this gold mine. This past summer, Mark Jones gave some talks in Brazil where there is a growing love of Reformed theology and Puritan writings. At least some of his books have been translated into Portuguese and published in Brazil. He is also in demand as a speaker across North America. With his youthful mind and love for God’s Word and God’s servants of old, I am hoping to see quite a few more books from him as the years go by. 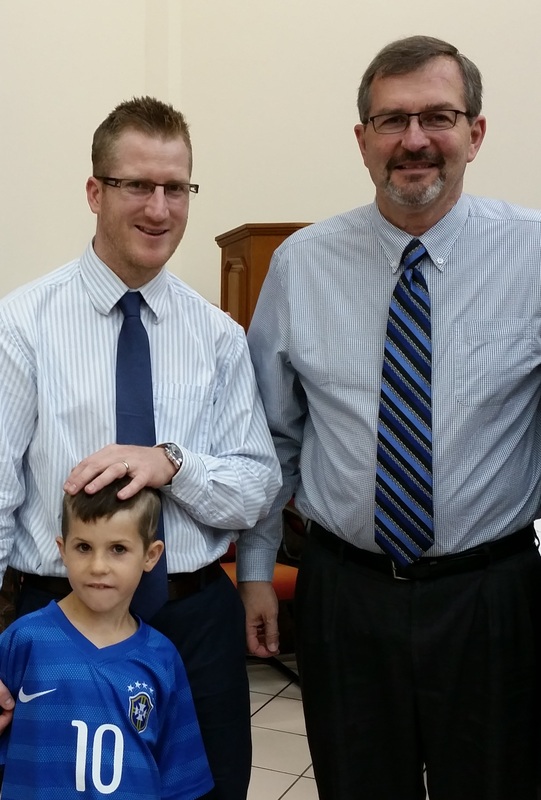 Mark Jones and son with Joel R. Beeke. Together, these two men compiled a great devotional and theological study of the Puritans titled A Puritan Theology: Doctrine for Life. I mentioned Joel R. Beeke a few paragraphs ago. Whereas I fight back being jealous of Mark Jones’ youth and brilliance, I have to combat a different type of jealousy regarding Joel R. Beeke, who is close to my age. Pastor Beeke produces books faster than most people read them. He writes, edits, compiles, or reprints and promotes more books than I can keep up with. He may be the leading expert on the Puritans in our time. I recently read and greatly enjoyed his latest book Reformed Preaching. Take this warning: No man dare enter the pulpit without reading deeply, prayerfully, slowly, repeatedly, and thankfully from this book. It is a wealth of practical instruction and guidance for the pastor and speaker. Also, it is a history of preaching. In fact, much of the book is a history of the preaching styles and focus of great preachers. The history begins with the Reformers, and that does not mean just Calvin and Luther. No surprise also that Beeke, as a proponent of the Puritans and their theology, includes lots of biographical and exhortative information about those hardy Englishmen. There are also chapters devoted to Dutch preachers. I can never really decide who were the greatest: The Puritans, the Scots, or the Dutch. I don’t have to pick a favorite, and they are all described here. Some of the more recent preachers like Martyn Lloyd-Jones are included as well. Even though the history section of this book is lengthy, I would have enjoyed yet another one or two hundred pages of such material. Pastors need to be well versed in history and theology, they need to also be grounded in other areas that Beeke addresses. These included being balanced (Woe are us Calvinists all too often! ), being effective (not the same as being successful, but also not the same as being theologically sound), and being holy (and that is not just a scandal in the Roman Catholic Church). The opening chapter of this book is titled “Reformed Experiential Preaching.” When I first started this book (in either November or December last year), I read that chapter in one sitting. The next reading time, I could not bring myself to move on in the book, but chose to read that section again. I am still planning on reading the last chapter, “Preaching for Holiness,” again. I have been blessed by being able to put this book in the hands of other preachers. I wish I could give out a hundred copies of it. My preaching career is over, so it seems, but still I found the book helpful and soul-nourishing. The man or woman in the pews can read this as profitably as the preacher. 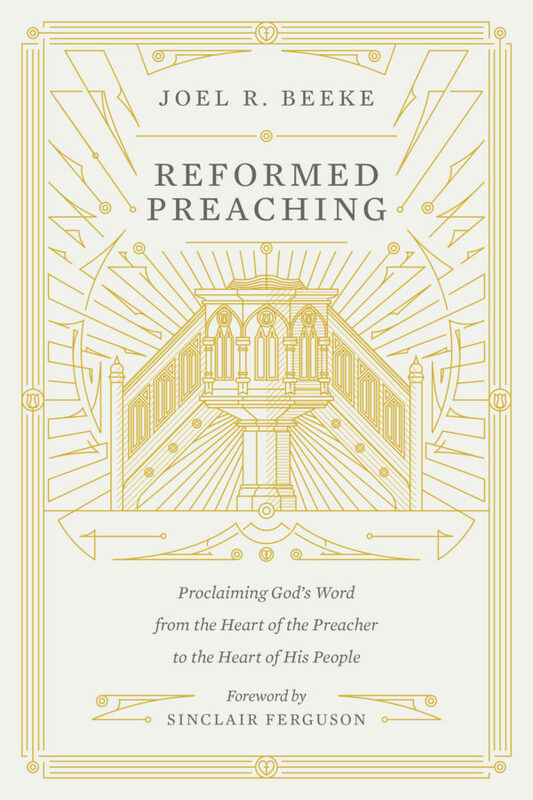 Reformed Preaching and God Is are both published by Crossway Books. Knowing Christ is published by Banner of Truth. A Puritan Theology is published by Reformation Heritage Books.